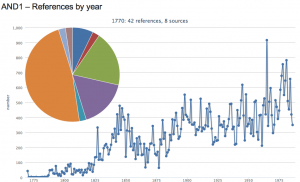 Click on any date along the graph and find a pie chart giving the composition of sources for that year (e.g. which Australian publications contributed most words to Australian English per year). Click on any part of the pie chart and scroll down the page to find the sources quoted in that year, along with the total number of words which that source contributed to Australian English. For example, click on the pie chart for the year 1898, and scroll down to see that the Bulletin magazine contributed 165 words, followed by Edward Morris’ landmark Austral English (82 words), followed by 70 words from the explorer David Carnegie’s account of his expedition across the Great Sandy Desert entitled Spinifex and Sand. All these results are, of course, limited to the sources which were ‘read’ during the making of the Australian National Dictionary (published by OUP in 1988). However, they still provide interesting insights. We see that the year 1965 contributed most words to the dictionary. This probably exhibits a bias in the dictionary reading programme, but it also shows the important contribution to Australian English made by three particular sources: first, the 1965 edition of A. H. Chisholm’s Australian Encyclopedia (201 words), followed by R. H. Conquest’s tales of the Outback entitled Horses in the Kitchen (93 words), and Graham McInnes’ classic autobiography The Road to Gundagai (74 words). If you look at the year 1955, you will see that the contribution from Patrick White’s Tree of Man (16 words) is dwarfed by the number of words from the travelogue of the American journalist Nina Pulliam entitled I Traveled a Lonely Land (99 words), followed by D’Arcy Niland’s The Shiralee (45 words), and Fred Lane’s Patrol to the Kimberley (41 words). * The digital tools discussed in this blog were created at the Centre by digital historian Dr Tim Sherratt. This entry was posted in ANDC, Australian National Dictionary, historical lexicography and tagged A. H. Chisholm, Australian English, Australian literature, Bulletin, digital tools, Edward Morris, Fred Lane, Grahan McInnes, Nina Pulliam, Patrick White, Patrol to Kimberley, R. H. Conquest, Shiralee, Tree of Man by Sarah Ogilvie. Bookmark the permalink.